Located in the historic Continental Gin at 4500 5th Av. S., Birmingham, let us share our passion for craft beer in our spacious and vibrant tasting room. 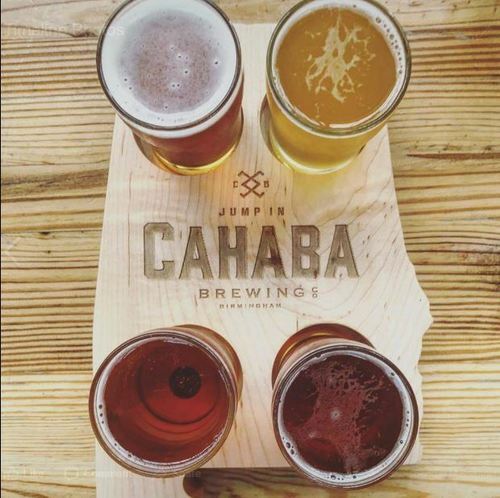 Mulberry Road, the third installment of the State Capital Series, will be brewed Cahaba Brewing Company. Mulberry Road is a Belgian style Dubbel inspired by the mulberry-lined streets of Cahaba, Alabama. Cahaba was the state's first permanent capital and is home to the Old Cahawba Archaeological Park. Mulberry Road brings more than the sweet flavor of mulberry, a portion of proceeds from the sale will be used to preserve the Old Cahawba Archaeological Park. Today, Tuscaloosa is widely known as the home of the Crimson Tide, but between 1826 and 1846 it served as Alabama's state capital. Tuscaloosa's Duffie's Tavern inspired the Alabama Brewers Guild to create Duffie's Tavern Strong Ale. During the capital days, the Tavern served as a stagecoach inn and political headquarters. The 2018 contribution to the Capital Series, features "hints of toffee and dried fruits," prominent in old English ale. A portion of all proceeds will serve the Tuscaloosa County Preservation Society.